The eggs of a mantis are enclosed in a foamy pouch called an ootheca or egg sack. When the female produces the ootheca it is soft, but very quickly it will dry to become firm en tough. The ootheca protects the eggs until they hatch. Every species of mantis has a different color, size and shape of ootheca. Some have just a few eggs inside, other species can have hundreds of mantis eggs inside just one egg sack. Most mantis species in temperate zones lay the ootheca in fall, after which all adult mantises die. The eggs inside the ootheca will rest until spring, when the nymphs will hatch and grow up to repeat the cycle. This female Hierodula membranacea is making a ootheca. When the female produces an ootheca, you have to make sure not to disturb her. Around 3 – 5 days after she has laid the ootheca, it has hardened enough to be removed from the enclosure of the female. It is recommended to remove it, because the nymphs need a different environment than the adult female. The female will also eat the nymphs if she is housed with them. Place the ootheca in a container that is more than 15 cm high and more than 8 cm wide to ensure there is enough space for the nymphs when they hatch. Of course extremely small species will do with less space, but generally these dimensions are suitable for all species. The container should have plenty of ventilation, either through a mesh or by punching holes in the plastic container. 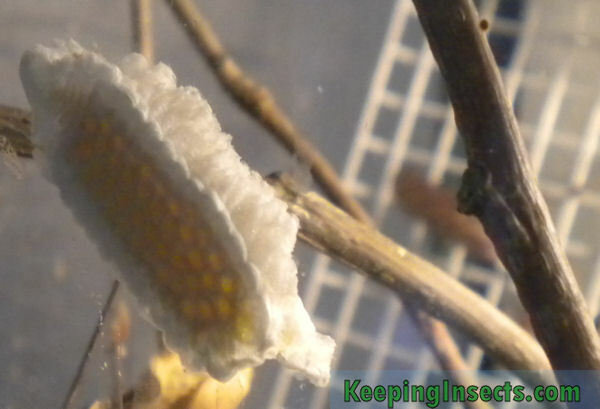 A Gongylys gongylodes mantis ootheca against glass, making it possible to see the eggs. Put the ootheca on the inside of the lid of the container. You have to place it in the same orientation as the female has placed it! 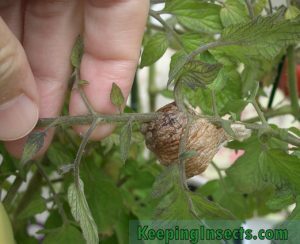 Attach the ootheca with double sided tape. Be sure to cover all the tape, because any leftover tape will kill nymphs that try to walk on it. You can also use a needle to attach the ootheca, but you can only put the needle through a part of the ootheca that has no eggs in it. This is generally the outer edge of the ootheca. Some species of mantis need a diapause, tropical species others do not. 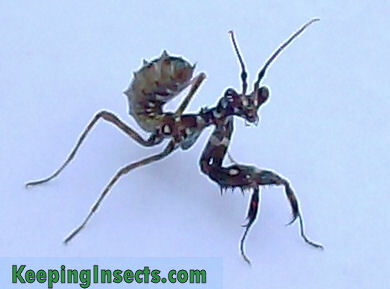 A diapause is a pause in development in winter, making it possible for the mantis to produce its eggs in fall and have the nymphs hatch in spring. Low temperature will arrest the development of the ootheca. Higher temperatures will trigger the development. Species that have a diapause in nature, for example the European Mantis, need to get this pause in captivity too. Keep the ootheca cooler, around 12 – 15 degrees Celcius, for at least 8 weeks. After that you can keep the ootheca as described. As tropical mantis species don’t experience seasons in nature, they don’t need a diapause. For hatching the mantis eggs, you need to keep the humidity and temperature in the container on the appropriate level for your species of mantis. You can find this information in the Species section of this website. You can keep air humidity high by putting substrate on the bottom of the container. Good substrate is paper, cloth, white sand or very small pebbles. As soon as the nymphs hatch, you have to transfer them to a appropriate container in which you can raise them. A very young Pseudocreobotra wahlbergii nymph is black, but will molt into white. The mantis nymphs are very small so you should be careful with them. They can get trapped on a bit of glue or resin residu or they can get caught in the fold of mesh. Make sure the enclosure is safe for them. The prey you will feed to these mantis nymphs should be the appropriate size. Most species will eat the small fruit flies Drosophila melanogaster. Very young nymphs are generally a bit less cannibalistic than the older nymphs. You can keep the young nymphs together in one big enclosure if you make sure there is plenty of hiding space and plenty of food. When they get older you need to place them in individual containers to ensure maximal survival. 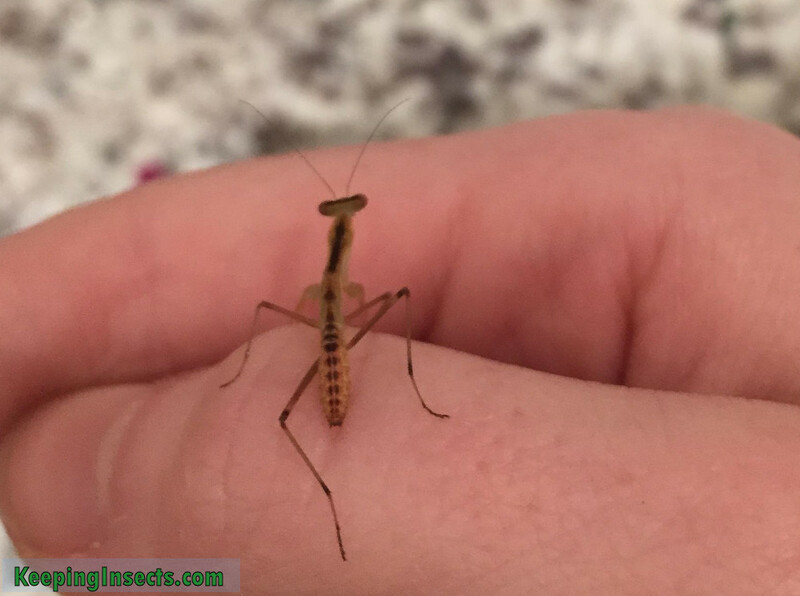 For more information about raising nymphs you should check out the individual page of the mantis species you are keeping. Every species needs a different air humidity and temperature to thrive. Next page: Male or female mantis?